What’s stopping people from buying flowers? The Floral Marketing Research Fund (FMRF) has released results from a study that provides new data about the barriers to and motivations for purchasing flowers. Peat producers are hoping for a break in the weather this fall, as conditions so far this year have led to lower than anticipated harvests. On October 2, come and see what’s new at Colonial Florists. Cutting-edge genetics from Dummen, Suntory, Danziger, Florists, PAC and Westhoff will be on display all under one roof! Enjoy the day meeting fellow growers around the region, and get a head start on planning your Spring program. Doors open at 11 a.m. and happy hour to follow at 4 p.m.
RSVP your company name and number of people to rose@colonialfloristsltd.com. We hope to see you there! 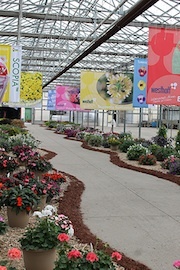 Dozens of growers and retailers browsed through one of Canada’s largest garden mum trials this morning at an open house hosted by Schenck Farms and Greenhouses. Ontario greenhouse tomatoes have been added to Hero Certified Burgers’ portfolio of toppings. Growers wanting ideas for next year's crop mix came to the right place at the annual George Sant & Sons Greenhouses Open House.